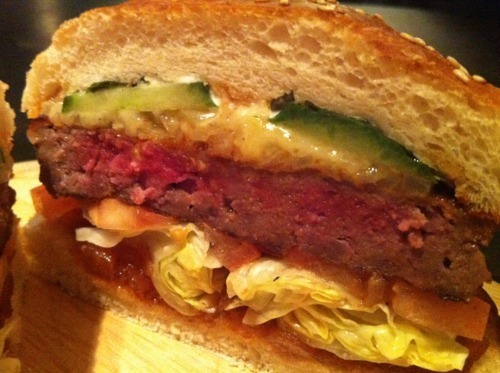 Tim Anderson, Masterchef winner and all-round good dude, writing about burgers on his blog in 2009. 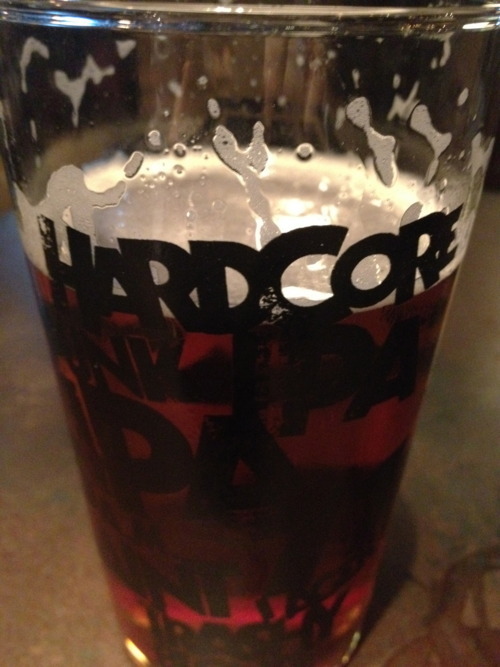 Our first official burger of 2012 took us to the first London bolthole of punk rock Scottish craft brewers, Brewdog. We’d heard that its short ‘n sweet burger ‘n pizza menu had been designed by none other than Tim Anderson. You know Tim. Off the telly. Beer geek. Proper palate skills. Terrifyingly knowledgeable. Has cooked at the Fat Duck and Noma and other places starred to the hilt. He’s a Wisconsinite, so he has a proper home ice advantage with American fare. 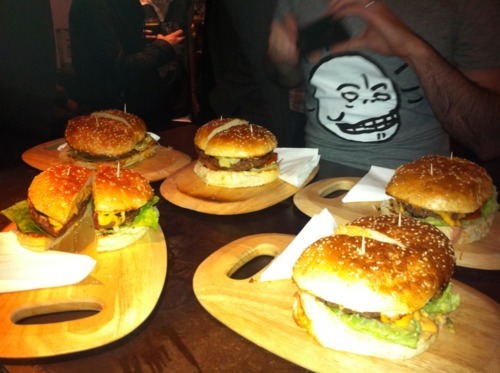 With just three burgers on the menu we thought we’d give them all a go out of courtesy, and also because they’re really sodding cheap. The burgers came out closed and already cut in half, which we thought was awfully polite of them as it made the proceeding obligatory burger split photos much quicker and easier. First we tried the Cheeseburger, known as the Los Feliz. Now, this is one thoroughly enjoyable burger. While the beef is pretty compact, visibly pre-prepped and not specifically memorable taste-wise, the overall package makes it a relishable prospect. The Punk IPA sauce looks like a Marie Rose but tastes like a mild Thousand Island nuzzled up to a Franco American mustard, and even some wasabi in there somewhere. 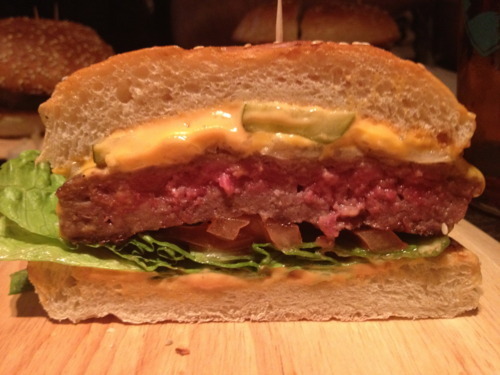 It coats the underbelly of the burger with a tickly heat but doesn’t overpower it. Alchemy. Plus, they totally lob it on the top and bottom bun, making the end product saucy in a gratefully American way; all too rare here in London. The cheese was dirty and deftly melted, combining with the wicked-smart sauce. On to the Curry Burger. It also has a name. We can’t remember it though, because by then we were a few ales in. Although this may seem like a bleedin’ obvious statement, it actually tasted like a mouthful of beefy curry. Nice one, Tim. It’s a genuine one-of-a-kind. The spicy heat-laden patty is surrounded by a sweet, tangy chutney and a fresh cucumber yoghurt, with some cheese thrown in for good measure. No burger is complete without it, am I right? Uncannily curry-like and burger-ish simultaneously, this surprised and delighted the table. Finally, the pork burger. 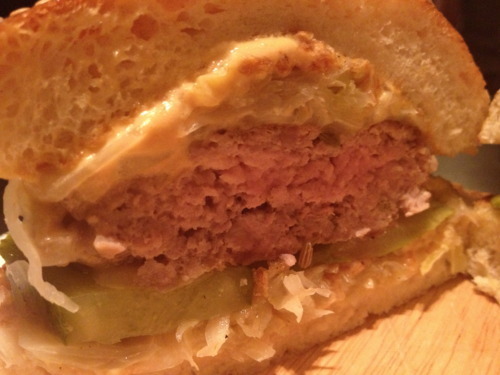 The most expensive by fifty pence or so, it’s a chunky puck of minced pork with a sauerkraut base, pickle and plenty of mustard. The vinegar hit was on the money here, a brilliantly unsubtle accompaniment for the beers on offer, but ultimately this was our least favourite of the three. It occurred to us very quickly that at £4.95, the Los Feliz is the best budget cheeseburger in London. It’s cheaper than the competition and the closest to a proper American budget cheeseburger yet, without any faux gastro posturing. And if that’s not your thing, the curry burger makes other attempts at novelty burgers just flat-out embarrassing. We highly recommend Brewdog if you need a place to eat a decent burger and sup a quality IPA before going to see the latest post-Gothcore math-dubstep band at the Underworld. And what pre-fame Tim wrote back in 2009? We think he’s cracked it. Special thanks to Friend of B/A Pete for helping us with this one.